It’s a fact: we all love a good crime story. This year, for the first time ever, crime fiction became the bestselling genre in Britain. Take a look at The New York Times bestseller list in any given week: you will find at least three books there in the categories of mystery, thriller, suspense or crime. How, though, do we explain our continuing passion for stories of death, blood, and goreBlut; hier: Gemetzelgore? 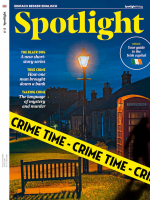 In search of some clues, Spotlight spoke to Professor of English Emeritus LeRoy Panek of McDaniel College, Westminster, ­Maryland, in the US, close to the city of Baltimore. Panek has taught crime writing. He is the author of a number of books on detective fiction, and he has won awards for his work on this topic. Spotlight: Our appetite for crime — in real life, fiction, in book form or film — appears to be insatiableunersättlich, unstillbarinsatiable. How do you explain this obsession with the genre? Professor Panek: First of all, it’s important to recognize that crime has always been a subject of great literature. Indeed, one can read most of Shakespeare’s tragedies as crime stories. Hamlet, for example, spends most of his time and energy in the play trying to uncover what has happened to his father. When popular fiction — reading for entertainment or relaxation — emerged in the 19th century, crime fiction satisfied readers in a number of ways that romances and science fiction could not. First of all, it showed the triumph of justice: that through the action of a hero, innocence can be assertdurchsetzenasserted in spite of the confusions of circumstance and officialbehördlichofficial ineptnessUnfähigkeit, Inkompetenzineptness. Next, it demonstrated problem-solving: the triumph of observation and rigorousstriktrigorous logic over prejudiceVorurteil, Voreingenommenheitprejudice and laziness. It also made readers participants. In some books, not only do they observe the process of solving a crime, but in the “whodunit (ifml. )Krimi-whodunit” form, they play a game with the writer, who does his or her best to play fair, but also to fool and surprise them. When did we start to fall in love with crime stories? Crime stories, as we know them, began in the early 19th century. The earliest kind were stories based on the defects of legal decisions involving circumstantial evidenceIndizienbeweis(e)circumstantial evidence. These responded to fundamental changes in Anglo-American law, to exemplifyveranschaulichenexemplified by the US Bill of Rights, which gave new protection to individuals accused of crimes. Next, there were police stories. These arose when England, France, and states in the US established police forces in the late 1840s. Finally, Edgar Allan Poe invented the reader-writer game story with his Murders in the Rue Morgue in 1841. In this piece, Poe gives his readers clues to the solution of the crime and then provides a solution that surprises them. How has crime writing changed over time? For the first 100 years, crime writing very rarely dealt with the most shocking kinds of crime — rapeVergewaltigungrape, child molestationMissbrauchmolestation, cannibalism, etc. And when crimes did appear, they took the stage only briefly and were described with euphemism(beschönigende) Beschreibungeuphemisms. The adventBeginn, Aufkommenadvent of serial killer books in the 1970s to abandonaufgebenabandons this approach and focuses on horrific crimes to perpetratebegehenperpetrated by individuals whose motives to defytrotzendefy and challenge rationality. Witnessed by the recent popularity of “Nordic noir” novels, crime writing is also no longer an Anglo-American monopoly. Most contemporary cultures have produced their own crime writer or writers. And, of course, detective heroes now reflect the diversityVielfaltdiversity of contemporary culture. Indeed, the flexibility in the choice of hero and setting is one of the virtueVorzug, Vorteilvirtues of crime fiction — and a principal reason for its longevityLanglebigkeit, Beständigkeitlongevity. Does crime writing mirror social and political change? It certainly reflects social change. This can, perhaps, best be seen in police fiction, where characters mirror the shifts in police personnel and in society. It is no surprise to find writers introducing women as well as gay, religious, or ethnic minorities who act as heroes and reflect the realities of a diverse culture as well. Science and technology, too, have changed crime fiction, and so has modern psychology. thusdadurchThus, contemporary fiction takes on darker and more troublingbeunruhigend, störendtroubling subjects and events than traditional crime fiction. Crime fiction’s connection with political change is far less clear. Perhaps the one area in which books reflect on politics lies in those set in totalitarian regimes or times, and that portray the difficulty of finding the truth in an authoritarian world. Does it take a certain kind of person to become a crime writer? Not really. But one does find a number of newspaper and media reporters who have become crime writers. Who is your favorite crime writer and why? This all depends on what I’m working on. It changes from time to time. The Norwegian writer Jo Nesbø is still one of my favorites, in part because of his mastery of detail and his updating of the hard-boiled hero. Raymond Chandler’s short stories are on my list because of his witGeist, Witzwit and mastery of American English. While he’s not quite a crime writer, I keep going back to Charles Dickens, too, and especially his Bleak House, which contains a crime story that is perhaps better than Wilkie Collins’ detective tale The Moonstone. The blessingSegenblessing and the curseFluchcurse of crime fiction, however, is that there is always another writer and always another book to read. If you had to write your own crime story, what would it be about? Being an academic, it would have to be murder on a college campus. The campus is the classic closed environment, and the faculty, deanStudiendekandeans, and students provide enough bizarre character types to satisfy any reader. Maybe it would be something like Death of a Donor, or Burglary at the bursarSchatzmeister; hier: KasseBursars. Ideally it would read like one of Michael Innes’ or Edmund Crispin’s (both of whom I should have mentioned above) loonyverrücktloony Oxford novels.